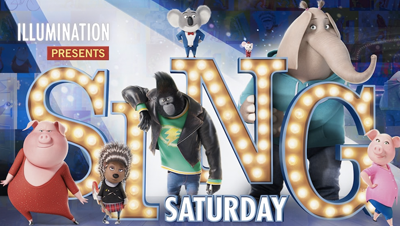 Universal Studios have taken inspiration from the global obsession with televised talent contests in their latest animation ‘Sing’. This light-hearted, family-oriented animation is written and directed by Garth Jennings, the man behind cult classic ‘The Hitchhiker’s Guide To The Galaxy’ and produced by Illumination Entertainment (‘Despicable Me’, ‘Minions’, ‘The Secret Life Of Pets’). With this calibre of talent, there’s no surprise that ‘Sing’ has been received with open arms. The story follows Buster Moon, a koala struggling to revive his theatre in a metropolis of talking, dancing and singing animals. With mounting bills and empty seats, he organises an amateur talent show in the hopes of reviving the grand theatre. The narrative expands to the locals, who enter in hopes of winning $100,000, and proving their worth. Incase the title didn’t give it away, the film contains songs, a lot of songs. From auditions, to practicing, to the final show, there are over eighty songs crammed into 108 minutes. This may seem overwhelming, but the majority are shown as snippets in a montage of auditions by characters of all different shapes, sizes and species. With features ranging from Katy Perry to Frank Sinatra; the film covers a range of well known tracks from modern pop to some beloved classics for the older audience to enjoy. The film features a stellar voice cast including Matthew McConaughey, Reese Witherspoon, Seth MacFarlane, Scarlett Johnansson, John C. Reilly, Taron Egerton, Tori Kelly, and Jennifer Hudson who work together to breathe life into the story and it's lovable characters. Just like Buster, each contestant must face their own challenges. Rosite, a stay-at-home mother of twenty-five piglets, fights for her last chance in the spotlight. Mike, a devious mouse refuses to let size determine his talent or his ability to undermine others. Johnny struggles with the decision to either follow dreams, or the steps of his criminal father. Meena, the bashful elephant must overcome her stage fright to finally show her worth, and Ash, a punk-rock porcupine fighting heartbreak and her own insecurities. Most animations contain an underlying message. Without being too cliché or preachy, ‘Sing’ inspires children to never give up on themselves. The multiple subplots of a bored mother, an insecure son, a heartbroken teen and a lonely man provide plenty of humour, and most importantly, relatability. Parents will be clapping for Rosita. Children will be rooting for Johnny and young adults will be gushing throughout. ‘Sing’ is a tale of the pursuit of dreams. The visual vibrancy throughout is one that crushes ‘Zootopia’ and the premise reminds us why the entire world has become obsessed with televised talent contests. People have stories, people have dreams but people need to work together to reach those dreams. ‘Sing’ is guaranteed not only to warm your heart, but also put a smile on your face.